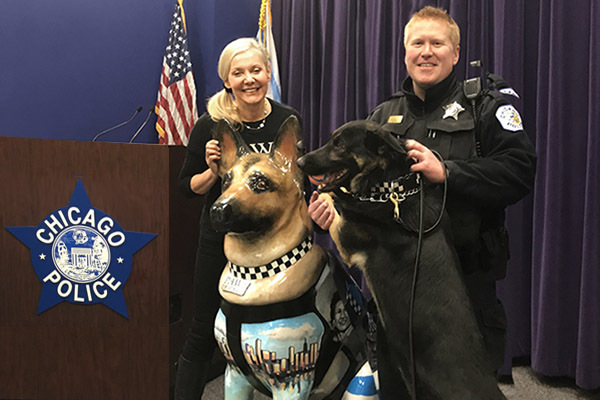 On January 24, 2017, leaders from the Chicago Police Memorial Foundation and PAWS Chicago came together to launch a new public art installation campaign and fundraising initiative called K9s for Cops. The initiative serves to memorialize Chicago's heroic fallen officers while supporting the families of police officers killed of police officers killed or catastrophically injured in the line of duty. A portion of the proceeds will also benefit PAWS Chicago's work to provide residents in underserved communities with free spay/neuter services and medical care for their pets. 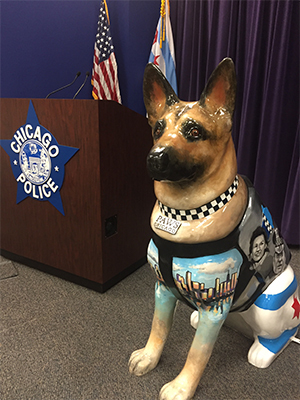 The German Shepherd Statues represent the canine partners who have assisted police officers for generations.Currently, 65 canines work with the Chicago police and assist with searches for missing persons, tracking suspects, article searches, detecting narcotics or explosives and public service demonstrations. Each dog statue will be individually designed and painted by artists working with sponsors. The statues stand approximately 54 inches tall, are locally manufactured using durable and weather-proof fiberglass, and are attached to a concrete base. They will stand guard in front of their sponsor' places of business or along Chicago's Magnificent Mile from July 23 through Labor Day. Each German Shepherd K9 statue can be sponsored for $2,000, with an option to purchase the dog for an additional $500. To sponsor a statue, complete this form and email to Bridget Schunda at b.schuda@cpdmemorial.org. You may also contact Bridget for more information at 630-890-5431.